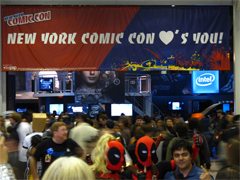 Road to NYCC '11: Find Your Geek-Mate! There are so many amazing and unique things that happen at Comic Con. Any geek can walk in and find their niche. It's a place where we geeks are surrounded by our own kind, plus lots of toys and comics. So, when they announced the Lightning Fast Speed Dating would be holding sessions at NYCC last year, I thought it was a perfect idea. I didn't get to make it unfortunately, but I heard some wonderful stories. I even know that there were couples made by the end of the weekend. Well, they are back again for a second year in a row, with a chance for you to find a new friend or even more. It can be said that geeks, like most people, have trouble dating. I know it can seem uncomfortable to just go sit down and talk to someone. You have to put yourself out there. This is different though. If it were just a run-of-the-mill speed dating event, you would have no idea who you might meet. At this, you know that you have something in common. For those two minutes you are together, even if there is no connection, you can at least talk about the last episode of Fringe, argue the benefits of DC52 or who shot first. This year, they have added a new project; a geek dating documentary show will be filming at NYCC. The show will be following around a few geeks and (hopefully!) watch them find their match. A lot of the details are still under wraps, so I don't have a show name yet; I do know that it will be shown on a major cable network. Now, before you start asking if some tall guy in a suit will be giving away a rose, I can assure you that the show has more substance than the standard dating show. That scenario was what I was picturing at first until I spoke with the showrunner, Michael Gara. A geek himself, Gara is so committed to making this a true and honest show. The show premise is that it is a chance for that guy/girl who doesn't get a date at the drop of hat to find someone. Gara told me each episode would follow 3-4 people as they try to find love. There are no producer organized surprises or date coaches behind the scenes either. These are actually real geeks, just like you and me. The best part of talking with Gara was hearing how much he cared. He wants geeks to find love and be happy. As he put it, "I think this is lightning in a bottle and I don't want to blow it." That makes me feel that us geeks are safe in his hands. If you are interested in trying for the show, right now they are still looking for girls to take part. Their biggest requirement is that they want honest, true people that aren't heavy daters. You can get more information about the show by emailing speeddatecasting@authentictv.com. To just learn more about the Lightning Fast Speed Dating, check out the session details here. I hope that if you are interested, you take this chance. I will be there, totally nervous and probably talking to everyone about Fringe, so don't worry. You won't be alone.